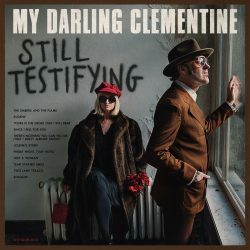 The thought of working with our sweet and loving partner may be enough to send many of us quivering into the corner (or perhaps the pub) but that’s exactly what husband & wife team Michael Weston King and Lou Dalgleish did when they formed My Darling Clementine. Is it a marriage made in music heaven? Or do I hear the sound of divorce bells and a guitar being inserted unceremoniously into a tetchy spouse’s rear end? By this stage – 3 albums and over 400 live shows since their inception in 2011 – we have to presume that something about it works for them and, with a good dynamic between the two singers, a complimentary vocal style and well-pitched harmonies, there is enough to choose from that does. This latest release is something of a departure from previous form in that their historical preference towards a lean brand of British Country has given way to something a little more eclectic and exploratory. The band’s very name is the first clue as to their past influences but on this album they nod to many more – sometimes with a sly wink (opening track The Embers and the Flame is awash with these) and sometimes with as much subtlety and nuance as Donald Trump’s bathroom (the Bacharach-branded Just a Woman for example). Jolene’s Story is a rather literal take on the Dolly Parton classic starting from the eponymous man-stealer’s point of view in which Dalgleish sings that yes indeed, she did in fact take away her man, a reference that’s so on-the-sleeve as to be almost stepping into the realms of parody. The song soon brings in the man in question and they lament their guilt with a suspiciously jolly lilt. The novelty of this would perhaps be a lot more novel if it wasn’t for a track on previous album The Reconciliation? called No Matter What Tammy Says (I Won’t Stand by Him) leading the way. Perhaps this trend for taking classics and reworking their central ideas will be frivolous fun for some, but for others there may be the slightest of cringes. Venture further in and listeners are treated to homages to The Carpenters and even Elvis Costello in places, fresh in some moments – an unexpected take on a classic melody for instance – and contrived in others, like those mentioned above. There’s a thin line between clever, subtle experimentation with some classic tropes and trying too hard to disguise limited creativity by magpie-ing merrily through the great American songbook. This album sways over that line often, though not wildly or far. There’s a lot for traditionalists to enjoy whilst the wider-ranging instrumentation than on previous outings – some tight brass sections, Wurlitzers, recorders and vibraphones as well as a chorus of children – takes more traditional country and slaps it with a soul and gospel vibe repeatedly for fresh appeal. The guitar work is varied and creative but, again, influences are evident – the pleasingly lazy Mull of Kintyre Strum of Shallow and the electric riffs and stabs of There’s Nothing You Can Tell Me reveal perhaps a long-held fondness for the Beatles and, since the Beatles, in their early days, took classic songs with barely disguised piracy, perhaps there’s something of a tradition being upheld. Overall it’s an enjoyable safari through a range of styles with some fresh takes on some older ideas but finally some will feel that, as the lyric says, there’s nothing you can tell me that I don’t already know.